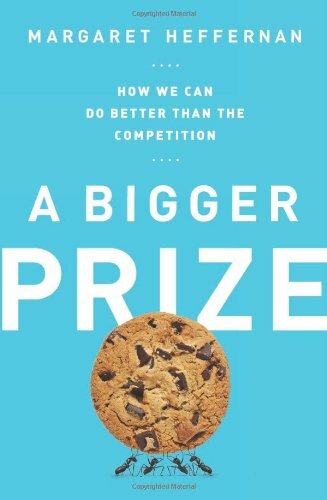 Margaret Heffernan’s recent book on the topic of Competition is an important read. Her view of competition will really mess with your current views. Guaranteed. It is worth the effort. Yes that means that A Bigger Prize: How We Can Do Better than the Competition is tough going. The final paragraph of Harvey Schachter’s great review is spot on. She goes on and on, not just listing the damages she ascribes to competition but also indicating why the alternative, collaboration, is preferred. It’s sobering reading, well researched and illuminating in its examples and scope.